The emergence of more complex treatments for both diamonds and coloured gemstones and the development of sophisticated synthetic (man-made) diamonds and gemstones has meant that the use of standard gemmological techniques alone cannot entirely guarantee the identity and quality of a stone. For this reason, GSL employs a range of advanced Spectroscopic techniques in order to further analyse gemstones. 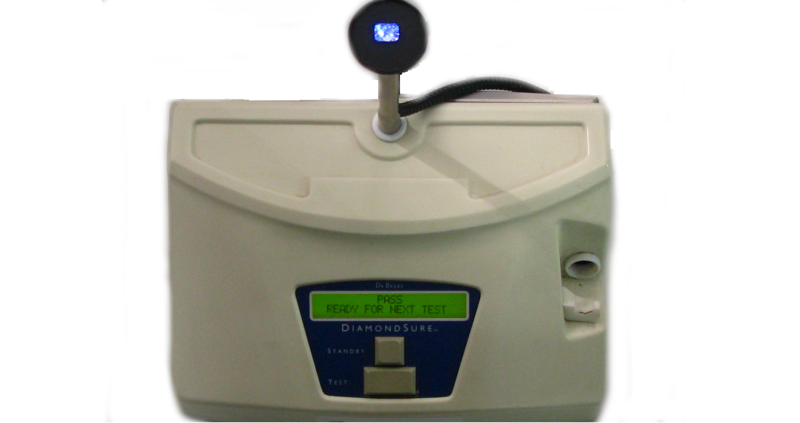 Every diamond that is tested by GSL is first tested on the DiamondSure. Then, if required, further testing with advanced instrumentation is done. The advanced instrumentation used at GSL includes the Vibrational Spectrocopic methods of Fourier Transform Infrared Spectroscopy (FTIR) and Raman, and the Electronic Spectroscopic methods of UV-Visible-Near Infrared (UV-Vis-NIR) and Inductively Coupled Plasma Mass Spectroscopy (ICP-MS). Specifically for diamonds, DeBeers DiamondSure investigates the absorption in the deep violet section of the spectrum of a diamond to determine whether it is Type I or Type II and further investigation of the UV transparency of a diamond is carried out on every diamond that is presented for testing and certification to the GSL Laboratory using a number of other more advaced techniques before a Diamond Grading report is generated. FTIR confirming polymer additive in emerald. FTIR analyses the vibrational behaviour of molecules, with each functional group in a molecule having characteristic wave numbers. This is a non-destructive analysis technique which can be used at room temperature or if needed at Liquid Nitrogen temperature (especially when investigating diamonds). FTIR produces spectra for each analysed sample, and these spectra are then compared to known spectra in our reference library. Investigating spectra indicative of Argyle Pink and Blue diamonds. Investigating if a coloured diamond has been treated for colour. Distinguishing between Oil, and Polymer based treatment of emeralds. Determining whether Jadeite jade (Fei Cui) has been treated with polymers and/or dye. Raman confirming natural colour in Fancy Orange diamond. Raman is a form of vibrational spectroscopy that can be used to analyse very small samples. This is also a non-destructive testing technique and is very reliable in identifying a mineral by comparing its spectrum to known spectra in the GSL reference library. This can be done at room temperature or at Liquid Nitrogen temperature as is required. In Photoluminescence mode our Raman Spectrometer can allow GSL to identify CVD synthetic (man-made) diamonds and Type II diamonds that have been treated to produce a very high colour grade (see Treatments section). Raman provides different information from FTIR, as the physical way that the techniques analyse a samples spectrum is different. However the results are often considered in conjunction can provide the final answer regarding a gemstone or diamond. UV-Vis-NIR confirming Non-Schist geographical origin of emerald. UV-Vis-NIR is a type of electronic spectroscopy, which can potentially be used for quantitative analysis of samples. 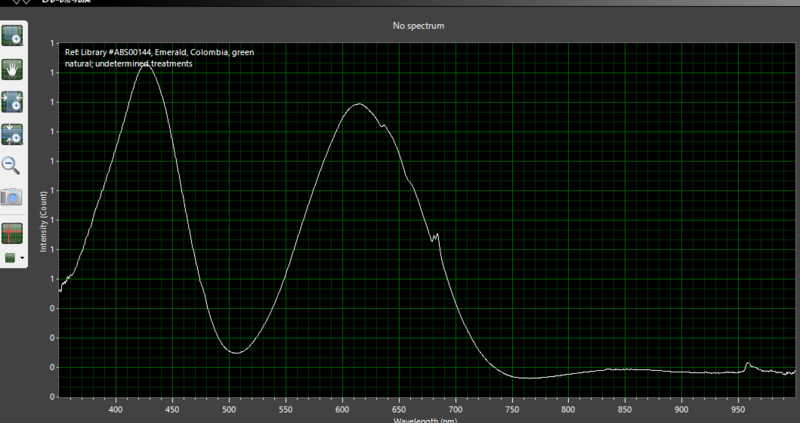 UV-Vis-NIR analyses spectra in the Ultra Violet - Visible - Near Infra Red range of the spectrum. 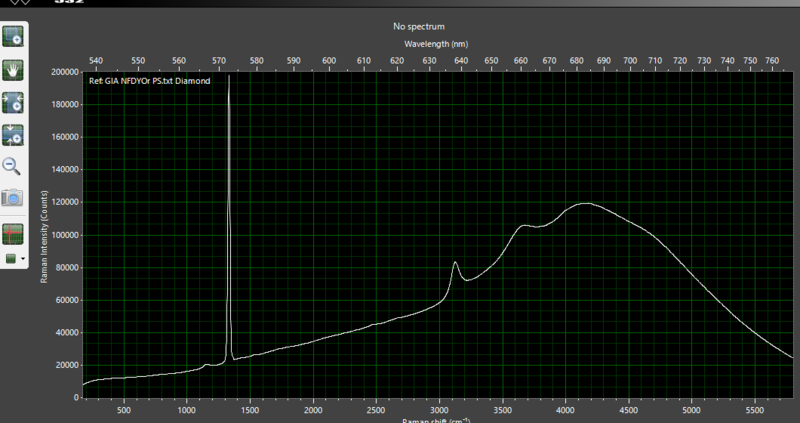 The spectrometer extends the spectrum range beyond the visible range that can be seen using a hand held spectroscope and is much more sensitive giving much more detail on the graphs seen on the computer screen. UV-Vis is used at GSL to determine the geographical origin of emeralds, as it can distinguish between Schist and Non Schist stones. It is also very useful in determining whether the colour in a light "neon" blue or green tourmaline comes from copper (Paraiba type) or from iron. It is also helpful in testing whether a fancy coloured diamond has been irradiated to produce the colour.